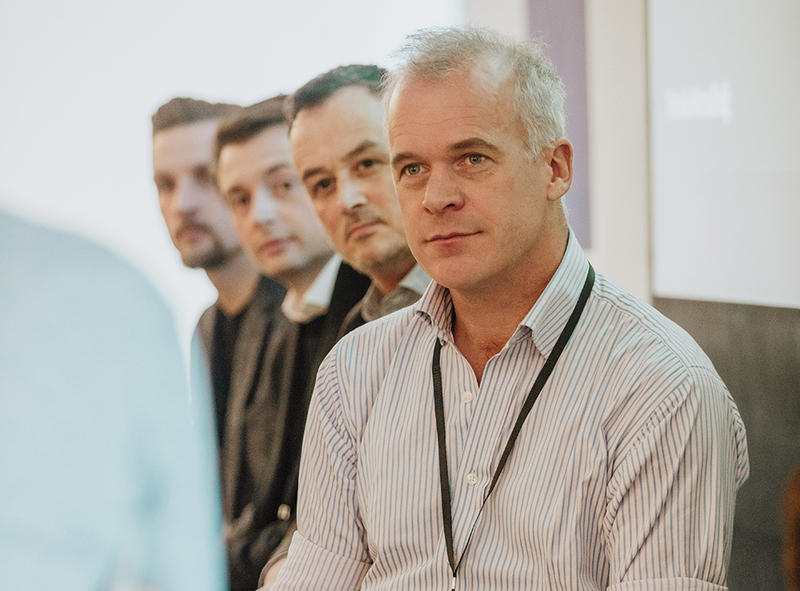 Our Dragons, comprising Andrew Shaw of Bibendum, Matthew Hennings of Hennings Wine, Paul Jenkins of Caprice Holdings and master sommelier Piotr Pietras, heard a series of rapid-fire, five-minute pitches before retiring to decide on which idea they would ‘invest in’. Pronouncing judgement, head Dragon Shaw described Anne Burchett’s pitch on promoting wine through tourism as the most compelling in terms of raising the profile of French wines and tying the wines into the regions and cultural experiences that holidaymaking Brits widely understand. Burchett was up against Hal Wilson of Cambridge Wines, arguing that French producers should focus more on supplying direct to indie merchants, commentator Robert Joseph, pushing the benefits of Vin de France wines, Stefan Neumann MS, looking to sell a greater focus on crémant, and Raul Diaz, pitching that engaging millennials was the best way forward for France. The audience was also given a ‘people’s vote’, showing either blue or red cards (with ticks and crossed respectively) for each pitch, adding a further buzz to the proceedings. Here are some of the varied and thought-provoking arguments put forward during those pitches. Wine is different from any other fast-moving consumer good product. It is dispensable. Never forget that most consumers can and do live without wine being important in their lives. Wine is expensive and wine is a blind purchase – you have very little engagement with the product while it’s in its original packaging – and wine is complicated. So how do we convince British consumers to favour French wine? What does France have that other countries don’t? We are the other side of the Channel: it’s easy, it’s close, and that makes a big difference. We know that millennials value experience over owning things and they are a very important demographic for the future of the wine trade. But the over-65s also spend over £5 billion a year in the first five years of retirement on an experience-driven lifestyle, so they are very important too. Wine tourism, when well done, is the ultimate form of experiential tourism. It involves all senses: wine regions in France are beautiful, you can have great food, you can have great fun, it’s really all-immersive. It takes time. It takes money. But it’s a winner. Millennials are the largest living generation today in terms of buying power and market share. The market is ripe with opportunities to attract them, to seduce them. But what is the key? To know what they want. But also to create tailored offerings, something unique. How do we do that? First: value for money. Millennials worry about what they spend, but once they find something they trust, they can relax and spend a lot. France has immense diversity: in every region you can find quality wines and also value for money. The second idea is the influence of friends. Recommendations are key. You attract that by embracing social media and being creative. The third point is authenticity. Millennials grow up travelling: they’ve been in many places, see a lot of different food and wine, so they value authenticity. Millennials like tradition, authentic products, but in a non-pretentious way. It has to be easy, cool and fun. The fourth idea is experience – but it has to be a real experience, something that is memorable, so they can share it. Authenticity of product and experience. France has everything to give the millennials and younger consumer. Price is really important. Champagne is expensive, but crémant can offer similar quality for a better price. In order to promote crémant, it needs the support of people in the industry. What is stopping French restaurants serving crémant instead of Champagne and having a talking point at the beginning of the meal? As a buyer, I can apply some pressure to the bigger companies. If I buy a bigger quantity, I am sure there is something left in the marketing budget to take 10 people over to France. We are close, and if it’s easy to take people over to Champagne, then its pretty easy to take people to [a crémant-producing region like] Saumur as well. Food-and-wine pairing is another thing. We are relaunching a dish today at Dinner by Heston called buttered crab loaf, and I know this dish works fantastically well with Vouvray or Chenin Blanc. What is going to stop me putting a sparkling Vouvray or Chenin Blanc with it? Not much. And then I’ve got a good talking point. Cambridge Wine Merchants works with 80 family growers and a handful of cooperatives in France, buying directly or working with agents but shipping the wines ourselves. France retains the number-one spot in our business, accounting for 30% of our sales and 40% by value. Why ship direct? The importer-retailer tiered model inhibits the opportunity to grow your business locally and nationally, as you lose your competitive advantage, which squeezes your margins or renders you more expensive. It’s costly for those importers to service your account –and all of those costs need a return. Why France? There are 27,000 wineries, mostly family-owned, mostly exporting and mostly wanting to be in the UK. They are on our doorstep, and it is cheaper to work with French producers than any other producers outside of the UK. There is origin and authenticity and archetypes that set the benchmark for everyone. Proximity makes freight charges about £50 less a pallet compared with the next closest country. Wine comes down to fine margins, so we ship to our own place and avoid redelivery and other charges. Wine has to come from a specific place. We all believe this, don’t we? We all know what Pomerol is: it’s Merlot. Except that it wasn’t. Go back in time and it was a white wine, and Merlot is a recent arrival. So when are we stopping the clock, to say that a region represents this, or that? When it comes to food, we all love watching Masterchef, watching people create dishes with lots of ingredients, and yet, in wine we can’t do it. So lets look at flavour. They used to mix wine from Hermitage with Bordeaux and they made good wine. Now we can’t do it – except for Vin de France – and it’s sacrilegious. Why is it sacrilegious if the wine tastes good? La Vielle Ferme is an appellation wine in France, but in the US it’s the biggest selling French wine and has no appellation at all. We have been selling our wine, an IGP, to Monoprix, but they have asked us to take IGP off the label and put on Vin de France, because there is no price ceiling on Vin de France. What does Vin de France give you? Volume production, consistency, pricing that allows margins and allows marketing, which helps to create brands – a virtuous circle rather than a vicious circle. Our introductory Think France Awards winners were also unveiled at Think France, celebratig those companies and people that have done most to drive engagement and sales with the cateogry in the UK.